Imagine you’re at home, about to settle down with a snack in front of the TV, about to enjoy some well deserved ‘me time’ when you hear it. A buzz that seems to be coming from everywhere and nowhere. Then you see it: the biggest fly that has ever existed. Before reaching for that spray bottle of pesticide, consider the following. While it may seem easier to reach for a bottle of pesticide, you could be doing more harm than good. Pesticides are meant to kill and they are inherently toxic. They come in various forms, from sprays and powders to crystals and fogs. You may be thinking, ‘Where’s the harm? I’m not a bug’. While this is true, that doesn’t mean what is bad for the bugs isn’t bad for you too. If a chemical is bioaccumulative, your body will continue to collect it over a long period of time, without having the means to remove it from your system (another example of a bioaccumulative compound is mercury). So, while one instance of exposure to household pesticides may be insignificant, continual use over time may present some health risks. Chronic exposure to pesticides leads to much more dangerous symptoms. Being overexposed to pesticides can lead to damage to the liver and kidneys, disrupt endocrine functions, or even cancer . Unfortunately, many homes in America have some form of pesticide or pesticide residue  in their homes, leaving many people at risk of exposure. Don’t worry, you don’t have to live with these unwelcome guests, nor do you have to roll the dice with your health by using conventional pesticides. A clean home is something most of us strive to maintain, but we can’t catch them all! Here is a great recipe from Wellness Mama to use on those pesky pests instead of harmful insecticides. This recipe uses the power of natural ingredients like essential oils. While it isn’t meant to kill these pests, it is perfect for making sure they don’t come back. 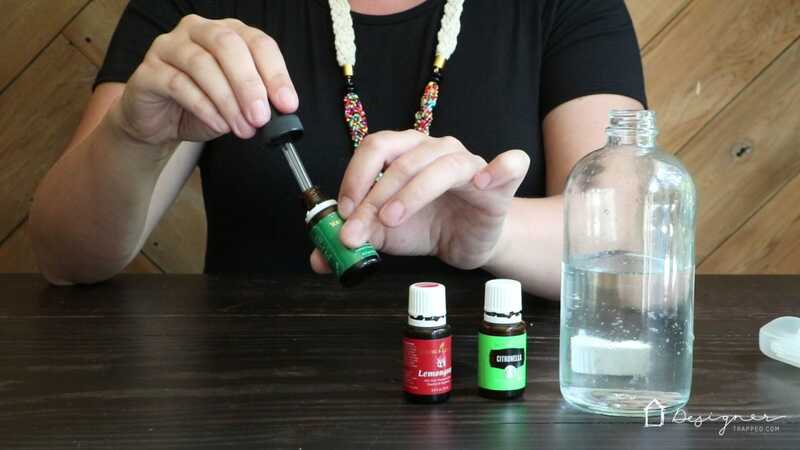 Combine the water, vinegar, and essential oils into the spray bottle. Seal the bottle and give it a good shake to combine all the ingredients. Spray it in the areas you notice pests are coming in, like windowsills or under doors. Make sure to shake well before every use. Now you’ll be able to keep pests out while keeping you and your family safe from harmful chemicals from conventional pesticides. Disclaimer: Essential oils can pose a toxic risk to household pets, especially to cats. Cats lack an essential enzyme in their liver and as such have difficulty metabolizing and eliminating certain toxins that can be found in some essential oils. Cats are also very sensitive to phenols and phenolic compounds, which can be found in some essential oils. The higher the concentration of the essential oil (i.e. 100%), the greater the risk to the cat. Click here for a full list of essential oils to keep away from your cats.